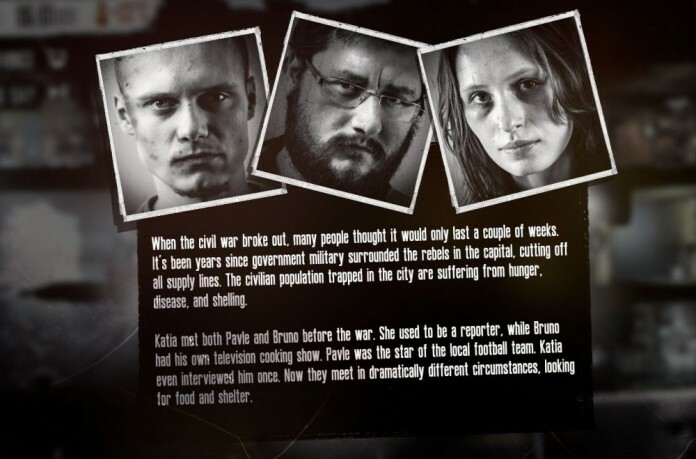 Knowing everything about the characters in This War of Mine is extremely important, as it can make a difference between a win and a loss: some characters are great in some areas and weak in others, and knowing exactly when and how to use them, as well as how to take care of them, is essential for survival in the long run. Therefore, after multiple playthroughs, I have decided to create this guide to all characters in This War of Mine and help you know everything there is to be known about all the possible guys and girls you can play in the game. Don’t forget to also check out our This War of Mine tips & tricks article – there are some helpful things in there as well. And now, let’s move to our This War of Mine guide to all characters. He is a good mathematician, which makes him good at traps. He only has 8 inventory slots in the backpack, but also has the nice bonus of being insusceptible to depression. One of the better characters in the game, she is perfect at sneaking and she could clear entire areas without being noticed or seen (she can literally break doors and not be heard!). She is a smoker and susceptible to depression or getting broken (if she gets there, she will steal supplies and run away), but simple acts of kindness keep her happy. Fortunately, she does not get upset when killing soldiers, which is really good as she can easily do one shot backstab kills. She only has 10 slots in her backpack. A good guy, despite being really slow. He has a huge backpack with 17 slots, but he is indeed insanely slow so it’s best to use him in smaller areas or a collector after a faster guy creates a stockpile closer to the exit. He can get depressed and he’s a smoker. The cook of the game, he’s extremely useful at home since he needs less ingredients to cook food and alcohol or craft meds. He won’t get depressed easily, but won’t cheer up others either. He has 10 inventory slots, but it’s best to always keep him at home to do the cooking. One of the most useless characters in the game. She gets easily depressed and loves children which, really, I don’t know how it affects the game. She has 8 inventory slots and whenever I get her as a starting character, I go for a new game. Ha! She is a logical person and doesn’t get affected by murder. She is a coffee addict and she appears to get tired at a slower pace than the other characters. She has 10 backpack slots. The character to have for getting better trading deals – which is actually her only big bonus. She has 12 slots in her inventory and a coffee addict as well. Nice to have around. Another great character to have around: he needs less materials when building stuff, so he can make the difference in the long run. He is another coffee addict with just 10 inventory slots and gets depressed really fast. Good to keep at home to do the building. One amazing character: a great scavanger who does everything faster, he also has a backpack with 15 slots, which proves extremely useful. He doesn’t have any addictions and even though the gets depressed or broken relatively fast, he gets better fast as well. The primary choice for scavenging in most situations. Not that good, even though he is extremely fast and has a decent backpack of 12 slots. He gets easily depressed and doesn’t recover well, but he helps others really nicely. He has no addictions, but he’s not great either – at best, the second choice scavenger if you have him in your game or the “mule” to send to create stock piles closer to the entry thanks to his speed. The killing machine in your game, he is great with weapons and does 1 backstab kills as well. He doesn’t get depressed easily (make sure you have cigarettes around), but when he does he can attack your other survivors. Good character overall, even though I would always prefer to have Arica instead of him. Another not that great survivor whose only skill is to help the depressed characters get over it faster. She also plays guitar well and has 12 inventory slots, but she’s not one of my favorites. So, there you have it! the guide to all characters in This War of Mine and all the details you need to know about them. It’s difficult to predict the bunch that you will get when playing the game (don’t forget that more will join as you play), so you always have to take advantage as much as possible of their bonuses and use them together as well as possible. There are worse teams that you can get, but this is part of what makes this game so amazing.